BBA: What do you think of the team’s 17-3 record and #11 national ranking? Does it accurately reflect the team? Anschuetz: Overall, I would say it does accurately reflect this team. Butler has proven time and time again this year they can win against solid opponents. They are 5-1 against ranked teams this year, including wins over Arizona and Villanova. BBA: How did it feel going into overtime against DePaul after two straight wins? Anschuetz: That game was the epitome of the saying that there are no off games in a conference like the Big East. The Bulldogs got off to such a poor start in the first half that I think there was a feeling of relief to make it to overtime and have a fresh five minutes after trailing for the majority of the game. BBA: Who do you consider Butler’s biggest Big East rival? Anschuetz: To me, Butler’s biggest Big East rival is Xavier. That answer is solely based off of how hostile the arena becomes whenever those two teams hit the floor, especially between fans. 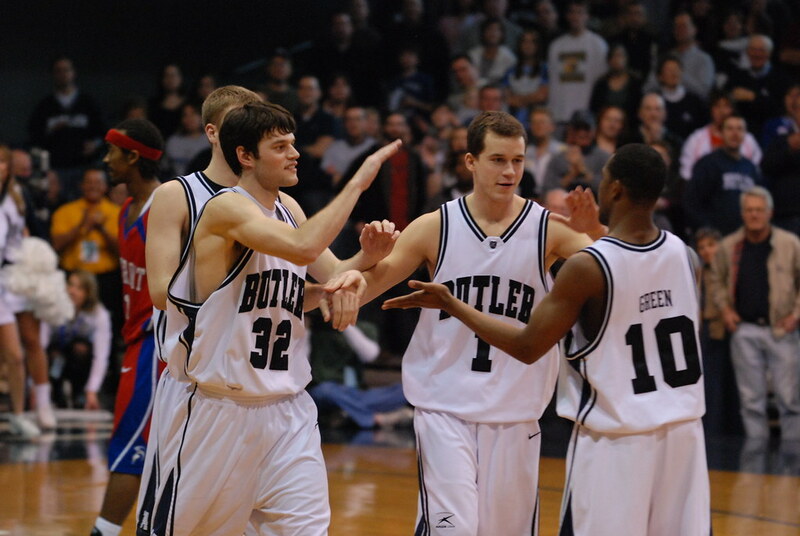 BBA: Do you think the Big East has been a good home for Butler compared to the Horizon League? Anschuetz: Yes. Although the change has led to tougher competition, the national exposure and ability to attract higher ranked recruits is a positive thing for the program. BBA: How far do you now expect Butler to go into the NCAA Tournament? Anschuetz: In this year’s NCAA Tournament, I believe Butler can realistically make it to the Elite Eight. With that being said, based on 2010-2011, a trip to the National Championship is not out of the question. BBA: After last season’s early exit during the Big East tournament, what do you see the Bulldogs doing this year? Anschuetz: I could see Butler making it at least one more round deeper into the Big East tournament. It is always hard to predict how hot a team is going to be down the stretch, but they should make it farther than last year. BBA: Roosevelt Jones and Kellen Dunham played huge roles in making sure that Butler was the only Big East team that Seton Hall didn’t beat last season. Who is going to fill their roles? Anschuetz: Kelan Martin, Kamar Baldwin and Kethan Savage have all performed well for the Bulldogs as of late. Senior Andrew Chrabascz is a crafty player down low and is also a great facilitator. BBA: Which player should the Seton Hall Pirates be the most worried about meeting on the court? Why? Anschuetz: The Pirates should be most worried about Kamar Baldwin. Specifically, the guards for Seton Hall because Baldwin is known for making big steals in big moments. His defensive presence is just as strong as his offensive presence. Anschuetz:The biggest challenge to Villanova before the injury to Maurice Watson was Creighton. Now, I have to go with Butler since they are the highest ranked Big East team who has beaten them. BBA: Which teams from the Big East will ultimately end up making the NCAA tournament? Anschuetz: From the Big East, I believe Villanova, Butler, Creighton are basically locks at this point. Marquette, Xavier and Seton Hall all have a realistic chance to make it. BBA: Final Score Prediction for the upcoming game? Once again, thanks to our new friend Grant Anschuetz for taking the time to talk to us! He can be found on twitter @Granschuetz and on Slump Sports! Tip-off is tonight at The Rock at 8:30 PM! If you can’t make it there in person, it will be broadcast nationally on FS1. Be sure to check by later for the game recap, and as always Go Pirates and Hazard Zet Forward!